*This Update Post is not a part of my Houkago Princess series I am currently releasing, however, it couldn't have come at a better time! Well done, significant announcements! 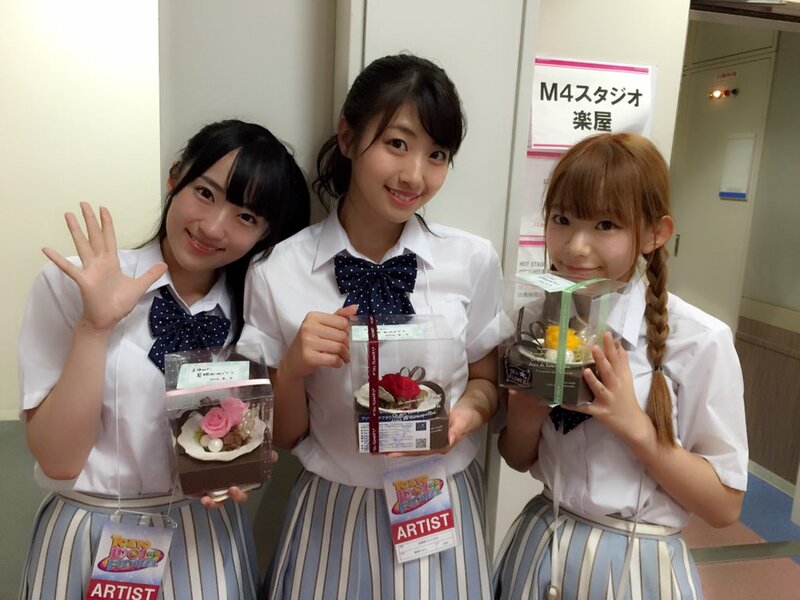 On August 7th 2016, it was revealed during the final performance at Tokyo Idol Festival that the Houkago Princess Cadet members Kojima Mayumi, Nagasawa Marina and Sekine Sasara had all been promoted to the Regular Lineup. Congratulations!!! Furthermore, the group also made the announcement that their 4th single is currently in the works! It will be released on October 12th, and is said to focus on the character Princess Ann from the film Roman Holiday, which stars Audrey Hepburn. Regarding my thoughts on the announcement, of course I am indescribably happy with the news, as well as a bit annoyed by it, too. On the very day I publish my post regarding these members' introductions as HouPri Youth girls, they go ahead and get Promoted to the Regular lineup! Pfft! It's super typical, but truly, I am happy with this announcement, especially now that Mayumin will appear in the PV's from here on out! I am, of course, most excited for Mayumin's debut, because of the Cadets she was my favourite. She radiates happiness, and honestly, she's just too cute! It's very clear that she adores HouPri and the senior members, and that performing brings her the utmost joy. Every time I see her in a post or a video, she's just beaming away, proud to be a member of such a wonderful unit. So, to see her debut is my dream come true, basically! She's truly deserving of it after all this hard work she has put in! With Marichu, though not my favourite of the three, I am really damn glad that this debut is finally happening, because firstly, she's wonderful, and secondly, she's spent near-on two years trying to prove to management that she's got a good work ethic and that she wants this as much as anyone else. And, honestly, it would be a tad stupid of both Cute Black and Universal not to recognise how hard she has worked to get to this point in her career; she's too well known for them to ignore, and she's far too popular for them to let go, too. So, if you ask me, she is extremely worthy of this Regular Member title, if not the most deserving. Sasara's debut is also one I've been awaiting impatiently, because I know that for her, Disney and Princesses is everything, and since becoming a member of Houpriyusu, this girl has given it her all and dedicated everything to the group with passion. All three of them have, however I think Sasara's undying passion for Disney makes her distinct, in a way. Plus, she has an elegant look to her that is deserving of a Princesses role... she and Maika will do nicely together in scenes, I believe, thanks to their maturity and gorgeous aesthetic! All three members will have their Coronation on September 22nd, during Houkago Princess one-man Live at Zepp Tokyo. Concerning the groups 4th single release, it has been confirmed by various members of Houkago Princess that the up-coming release has been titled 秘密のティアラとジェラート, or Himitsu no Tiara to Gelato (The Secret of the Tiara and Gelato). Based on the 1953 film Roman Holiday, the group will portray leading character Princess Ann, originally played by Silver Screen starlet Audrey Hepburn. The release date is set for October 12th this year, meaning that it will be delivered on Kizuki Saori's 25th Birthday... maybe that means it will be a Saorin lead? Who knows, at least until further details are revealed, that is. With the groups 4th single, it will be the first since Manatsu no Yoru no Yume to to include an entirely new generation in two years. Also, with the up-coming graduation of Mayuka, the latest single release be one of the first since the groups major debut to feature a fresh lineup. Single covers, costumes, the coupling track(s) and music video releases have yet to be revealed, however with only three months to go until it drops in stores, it is a short amount of time to wait. However, with these next three months passing me by, you can be blooming well sure I'll be the most impatient fan of all, because HouPri's singles really could (and should) come sooner. And, in a final piece of small news, the group will be releasing their second Calendar for the year 2017! On October 29th, it will be released, and include 8 pages. It will be size B2, and you can pre-order via CDJapan. All of these wonderful announcements have made my day, and I am honestly ecstatic about the up-coming release, as well as the new lineup! It's been a long time coming, and now it is finally happening! Congratulations to the new 7th Generation of Houkago Princess, and congratulations to the girls for their up-coming single! I await the release with anticipation and impatience, and will eagerly watch that PV Preview once it hits youtube! Until the next update, everyone, please take care, love Idols, enjoy the HouPri, and stay happy and Healthy! Mwah!